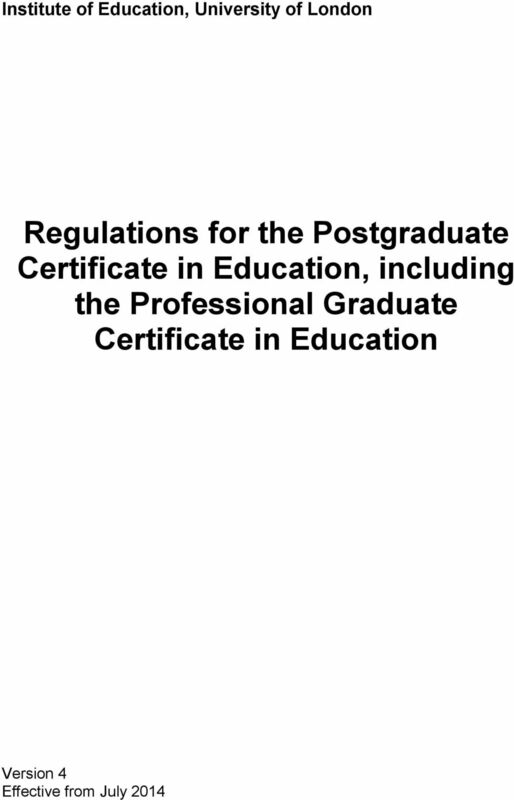 Download "Regulations for the Postgraduate Certificate in Education, including the Professional Graduate Certificate in Education"
4 3 Admission 3.1 In order to be admitted to the PGCE a candidate shall normally: On entry, possess qualifications recognised by the DfE as conferring graduate status. 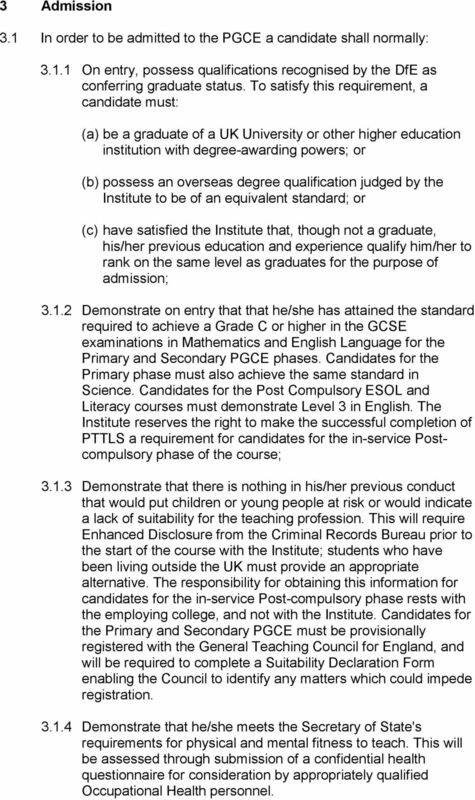 To satisfy this requirement, a candidate must: (a) be a graduate of a UK University or other higher education institution with degree-awarding powers; or (b) possess an overseas degree qualification judged by the Institute to be of an equivalent standard; or (c) have satisfied the Institute that, though not a graduate, his/her previous education and experience qualify him/her to rank on the same level as graduates for the purpose of admission; Demonstrate on entry that that he/she has attained the standard required to achieve a Grade C or higher in the GCSE examinations in Mathematics and English Language for the Primary and Secondary PGCE phases. Candidates for the Primary phase must also achieve the same standard in Science. Candidates for the Post Compulsory ESOL and Literacy courses must demonstrate Level 3 in English. 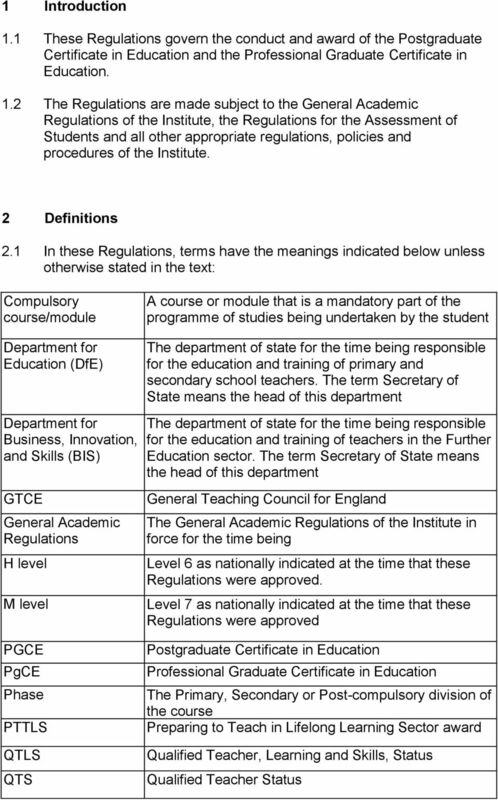 The Institute reserves the right to make the successful completion of PTTLS a requirement for candidates for the in-service Postcompulsory phase of the course; Demonstrate that there is nothing in his/her previous conduct that would put children or young people at risk or would indicate a lack of suitability for the teaching profession. This will require Enhanced Disclosure from the Criminal Records Bureau prior to the start of the course with the Institute; students who have been living outside the UK must provide an appropriate alternative. The responsibility for obtaining this information for candidates for the in-service Post-compulsory phase rests with the employing college, and not with the Institute. 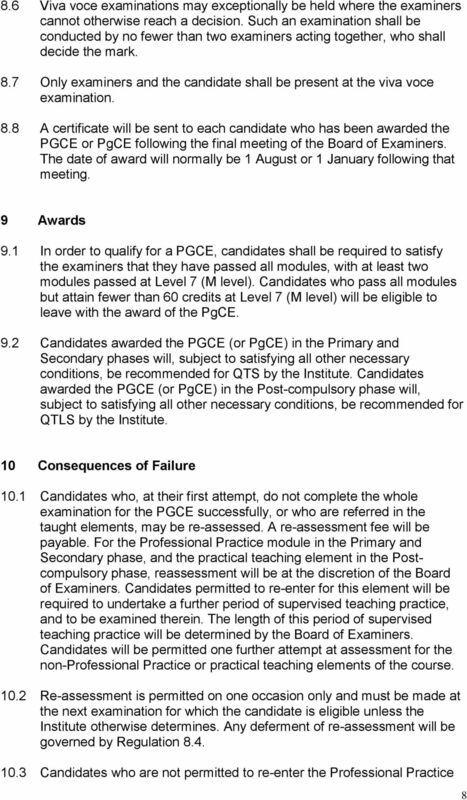 Candidates for the Primary and Secondary PGCE must be provisionally registered with the General Teaching Council for England, and will be required to complete a Suitability Declaration Form enabling the Council to identify any matters which could impede registration Demonstrate that he/she meets the Secretary of State's requirements for physical and mental fitness to teach. This will be assessed through submission of a confidential health questionnaire for consideration by appropriately qualified Occupational Health personnel. 5 3.1.5 Attend a group and/or individual interview and perform satisfactorily in the judgment of the interviewees Communicate well in spoken and written English. This will be assessed through the application form and at interview. Applicants may in addition be required to pass an approved English language test at a specified level. The normal minimum level of pass required in the International English Language Testing System (IELTS) will be 7.0 overall, with minimum scores of 6.5 for reading and 6.0 for writing; or overall scores of 650 in the paper-based TOEFL test; or in the internet-based test; or 280 in the computerised TOEFL test. 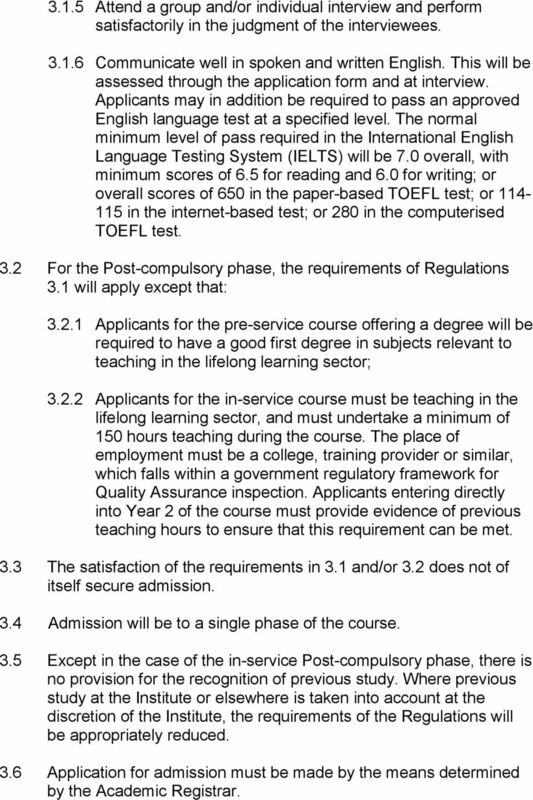 3.2 For the Post-compulsory phase, the requirements of Regulations 3.1 will apply except that: Applicants for the pre-service course offering a degree will be required to have a good first degree in subjects relevant to teaching in the lifelong learning sector; Applicants for the in-service course must be teaching in the lifelong learning sector, and must undertake a minimum of 150 hours teaching during the course. The place of employment must be a college, training provider or similar, which falls within a government regulatory framework for Quality Assurance inspection. Applicants entering directly into Year 2 of the course must provide evidence of previous teaching hours to ensure that this requirement can be met. 3.3 The satisfaction of the requirements in 3.1 and/or 3.2 does not of itself secure admission. 3.4 Admission will be to a single phase of the course. 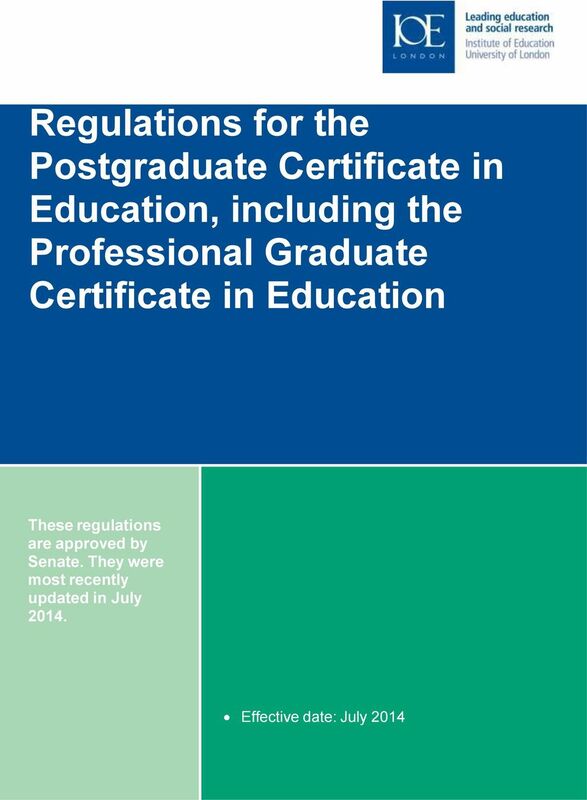 3.5 Except in the case of the in-service Post-compulsory phase, there is no provision for the recognition of previous study. Where previous study at the Institute or elsewhere is taken into account at the discretion of the Institute, the requirements of the Regulations will be appropriately reduced. 3.6 Application for admission must be made by the means determined by the Academic Registrar. 6 4 Registration 4.1 All persons seeking registration shall be required to produce original or certificated documentary evidence that they meet the requirements as set out in Regulation 3.1 and 3.2 where appropriate. 5 Programme of study 5.1 The course of study will normally be not less than one academic year if undertaken on a full-time basis, and not less than one academic year and one term if undertaken on a part-time basis. 5.2 The duration of the course of study for the Primary and Secondary phases shall not normally exceed a maximum of four academic years, and for the Post-compulsory phase a maximum of five academic years, from the initial period of registration. 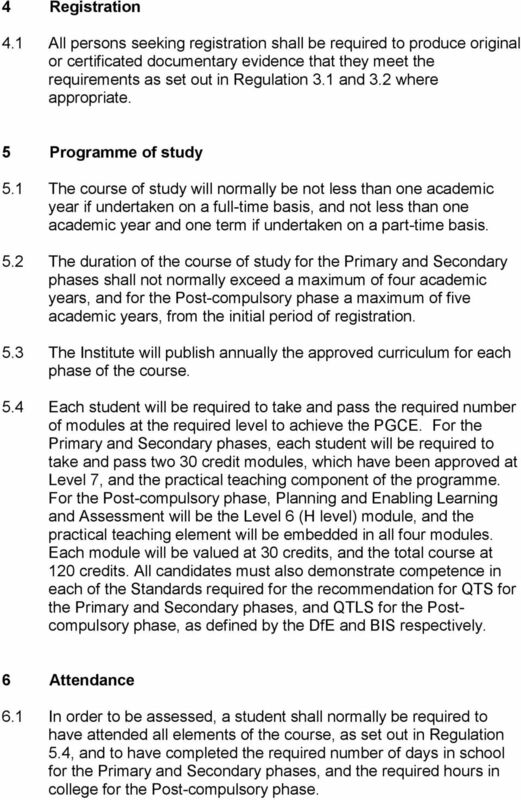 5.3 The Institute will publish annually the approved curriculum for each phase of the course. 5.4 Each student will be required to take and pass the required number of modules at the required level to achieve the PGCE. For the Primary and Secondary phases, each student will be required to take and pass two 30 credit modules, which have been approved at Level 7, and the practical teaching component of the programme. For the Post-compulsory phase, Planning and Enabling Learning and Assessment will be the Level 6 (H level) module, and the practical teaching element will be embedded in all four modules. Each module will be valued at 30 credits, and the total course at 120 credits. All candidates must also demonstrate competence in each of the Standards required for the recommendation for QTS for the Primary and Secondary phases, and QTLS for the Postcompulsory phase, as defined by the DfE and BIS respectively. 6 Attendance 6.1 In order to be assessed, a student shall normally be required to have attended all elements of the course, as set out in Regulation 5.4, and to have completed the required number of days in school for the Primary and Secondary phases, and the required hours in college for the Post-compulsory phase. 7 7 Medical fitness on-course 7.1 Students on all phases of the course will be required to consult the Institute's Occupational Health provider if there is a deterioration in health while on the course, or if there is evidence that health issues are affecting performance, and will be assessed in terms of implications for continuing training or for teaching in the future. Due consideration will be given to any help which might enable the student to meet the required standards for the award of Qualified Teacher Status or Qualified Teacher, Learning and Skills, Status, taking into account adjustments under the appropriate legislation. 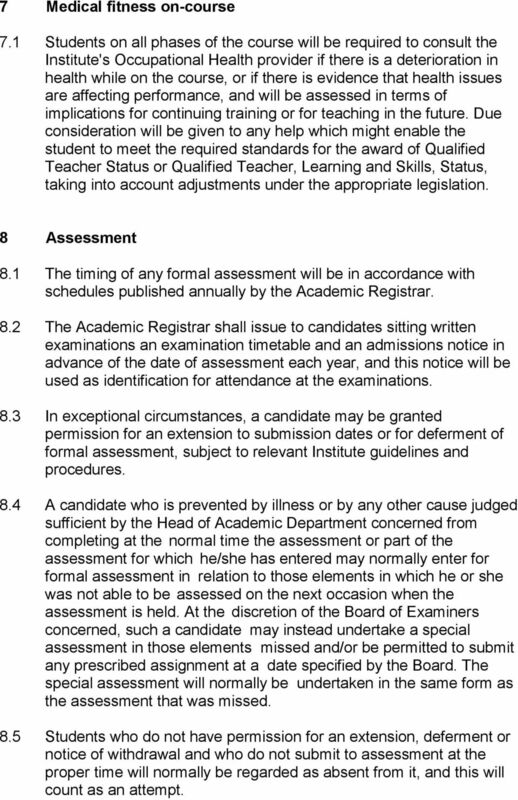 8 Assessment 8.1 The timing of any formal assessment will be in accordance with schedules published annually by the Academic Registrar. 8.2 The Academic Registrar shall issue to candidates sitting written examinations an examination timetable and an admissions notice in advance of the date of assessment each year, and this notice will be used as identification for attendance at the examinations. 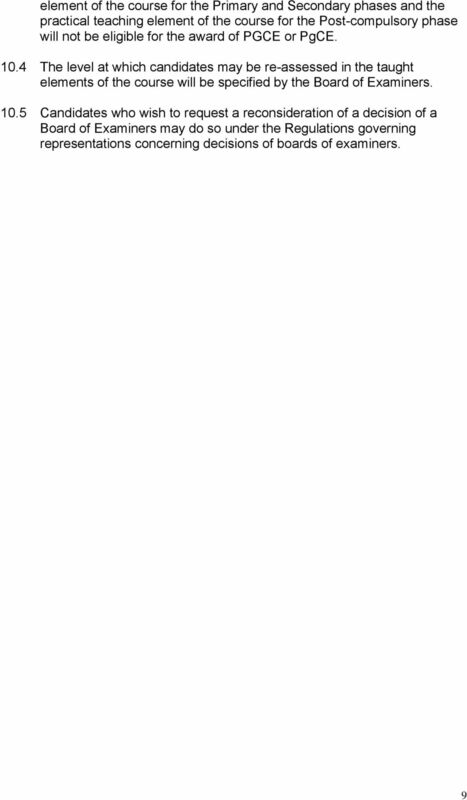 8.3 In exceptional circumstances, a candidate may be granted permission for an extension to submission dates or for deferment of formal assessment, subject to relevant Institute guidelines and procedures. 8.4 A candidate who is prevented by illness or by any other cause judged sufficient by the Head of Academic Department concerned from completing at the normal time the assessment or part of the assessment for which he/she has entered may normally enter for formal assessment in relation to those elements in which he or she was not able to be assessed on the next occasion when the assessment is held. At the discretion of the Board of Examiners concerned, such a candidate may instead undertake a special assessment in those elements missed and/or be permitted to submit any prescribed assignment at a date specified by the Board. The special assessment will normally be undertaken in the same form as the assessment that was missed. 8.5 Students who do not have permission for an extension, deferment or notice of withdrawal and who do not submit to assessment at the proper time will normally be regarded as absent from it, and this will count as an attempt. 3. This policy applies to all taught programmes of study offered by the College.